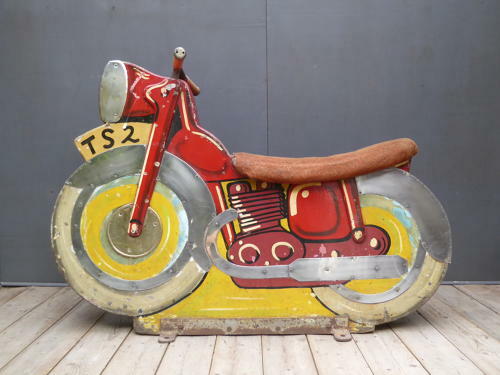 A wonderful example of a vintage fairground 'speedway' motorcycle. A super fairground bike in painted timber with its original chrome trim & carpeted seat. With beautifully worn paintwork, exceptional patination & a fantastic overall look about it. Wear commensurate with age, unrestored with wear to the seat covering front right. Collection in person due to size & weight please.